Data acquisition (DAQ) is the measurement, recording, analyzing, and presentation of real world phenomena. It includes electrical measurements such as voltage, current, power as well as measurements through sensors and transducers including temperature, pressure, flow, level, strain, acceleration, vibration, humidity, and more. 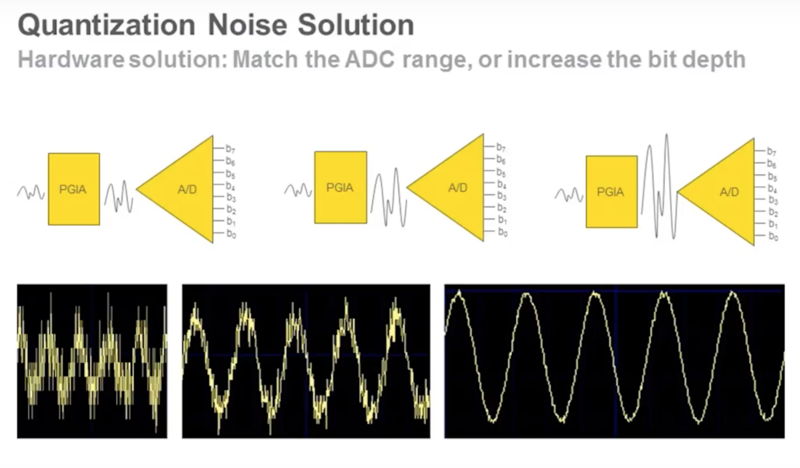 Selecting the ideal data acquisition components or solution depends on your application. 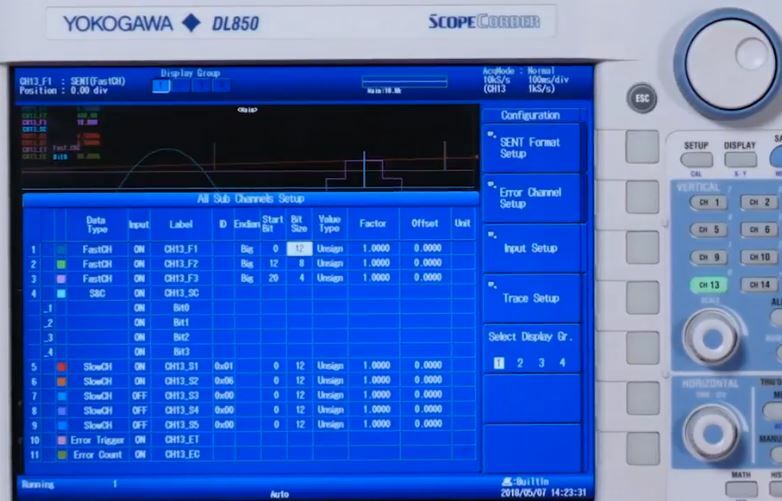 Typical factors include sample rates, channel scalability, signal conditioning, sensor types, analysis capability, mobility, and environmental conditions. 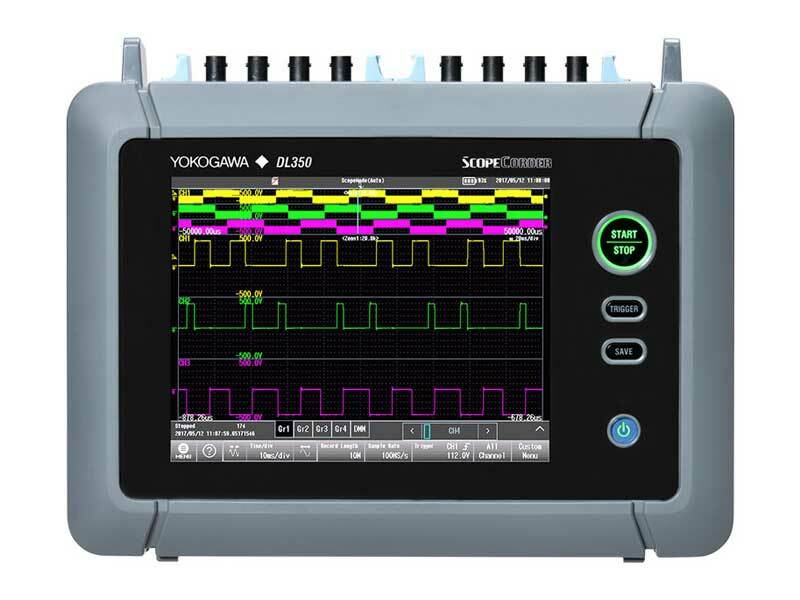 Yokogawa data acquisition solutions are recognized for industry leading measurement accuracy, noise tolerance, and build quality. 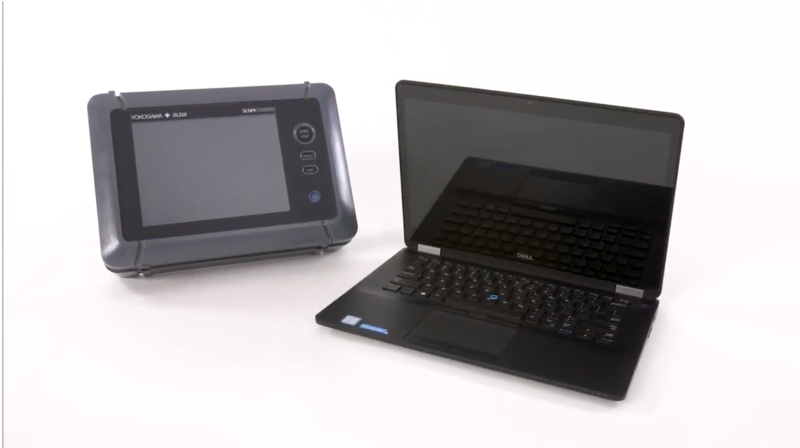 These include test & measurement software drivers, all-in-one architectures, and typically require no programming. We have developed the new SL1000 high-speed data acquisition unit which features a maximum sampling rate of 100 MS/s with 16 channels, and yet still offers 1-kV insulation. 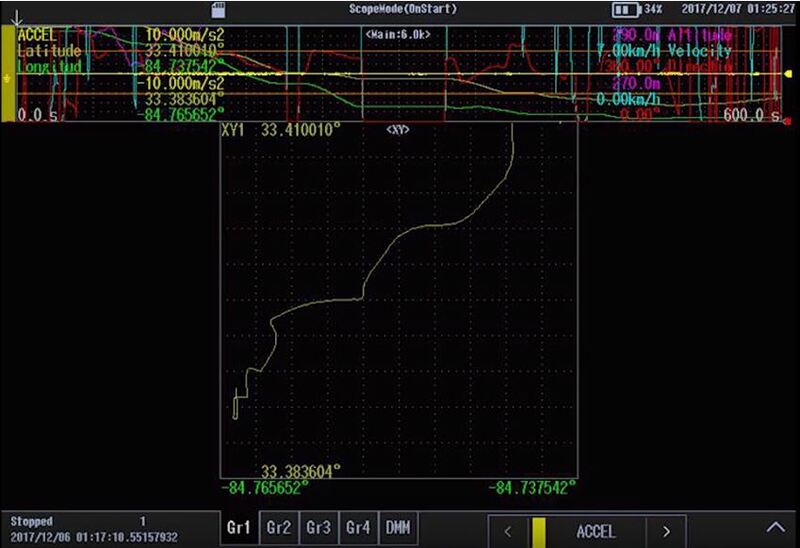 This PC-based instrument can also update waveforms at a high rate on the PC monitor like a single instrument, even for large quantities of data, due to the newly developed GIGAZoom Engine for data compression. 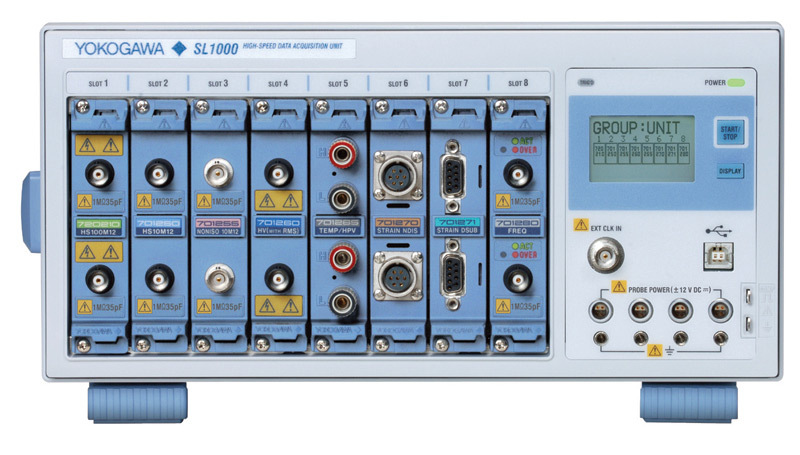 This paper describes the functions and technologies of the high-speed data acquisition in the SL1000. We have developed the WE500/WE900 measuring stations for the WE7000 series of PC-based measurement instruments. The WE500/WE900 have inherited the conventional plug-and-play architecture and high-speed data transmission function, and achieved even more advanced functionality and higher performance while maintaining compatibility with the conventional measurement modules. Along with the “embedded module” function that performs internal measurement data processing and autonomous operations, the WE500/WE900 come preinstalled with communication functions based on USB and Ethernet interfaces capable of transmitting data at a maximum rate of 480 Mbps. Yes, the WE7052 Fast Ethernet module supports DHCP. However, you must have the WE7000 control software ver. 4 or later. Yes, you can use the WE7051 Ethernet module (10Base-T) and the WE7052 Fast Ethernet module (100Base-TX/10Base-T) together. The optical interface cards and modules for the WE7031/WE7032/WE7033/WE7034 instruments and the new modules for the WE7035/WE7036/WE7037/WE7038 including cables, are cross compatible. Connection made by a cross cable does not comply with Ethernet standards. For reliable data communications, please use a hub when you want to make a direct connection to a PC. Yes, you can set the range for each channel. Yes, AC coupling is supported with the WE7275 2-CH, 1 MS/s Isolated digitizer module. Contact input/output is possible using the WE7262 32-bit Digital input/output module's 707823/707824 16-bit Digital input/output terminal box. You can select whether to save files in binary (WVF format) or ASCII (CSV format). WVF is Yokogawa's proprietary format. CSV format can be read by popular spreadsheet programs. You must wait at least five seconds after turning the main power switch OFF before turning it back ON again. Please do not switch the power OFF and ON in less than 5 seconds. The WE7241 digital temperature measurement module can measure up to ±50V. The WE7271/WE7272 4-CH, 100 kS/s Isolation digitizer module up to ±35V. The WE7275 2-CH, 1 MS/s Digitizer module accepts up to ±350V. Yes, you can use a 100Base-TX/10Base-T with the WE7052 Fast Ethernet Module. At present, a separate DC/AC inverter is required. 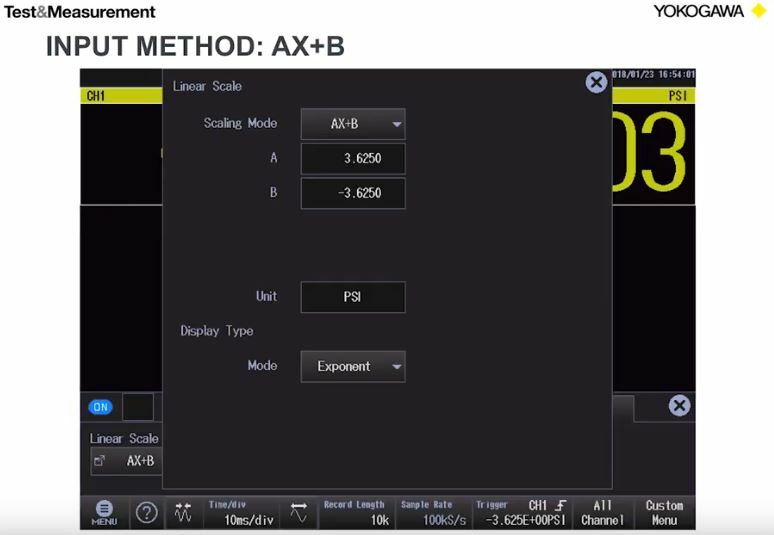 In case of the WE800 measurement station (eight slots), it has a maximum power consumption of 550VA.